For further information about the park’s history, two articles entitled ‘Saumarez Park’ by Rosemary de Sausmarez and ‘A Little Japan in Guernsey’ by the Hon Marion de Saumarez and J E Moullin can be obtained at a nominal cost from The Guernsey Society (Winter 1967 articles). Otherwise a visit to Guernsey’s Priaulx and Guille-Allés libraries would no doubt provide further information. 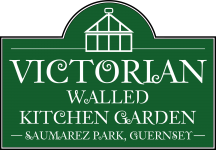 Guernsey Botanical Trust’s project to restore the Victorian Walled Kitchen Garden was pioneered by island resident Raymond J. Evison OBE VMH, breeder, nurseryman and Vice-President of The Royal Horticultural Society. The Trust’s patrons are His Excellency The Lieutenant Governor, The Bailiff of Guernsey and Lord Eric de Saumarez. Since 2006 a mountainous amount of site clearance has been carried out by our band of willing volunteers and a six-bed vegetable layout, plus soft fruit and coarse vegetable areas, have been developed. The garden produces well-yielding crops in varieties appropriate to the Victorian era 1837 – 1901. Every year since 2008, produce from the garden has gained several first prizes in the Northern Agricultural & Horticultural Society’s annual show held in Saumarez Park. A replica of the original greenhouse, the Lemon House was rebuilt in 2010 and the Orchard House was rebuilt in 2012. A reproduction of the remaining original greenhouse, the Vine House, was built in 2014. The North wall of the Victorian Walled Kitchen Garden now boasts a magnificent 170′ run of South-facing glass houses. As well as cultivating fruit, vegetables, flowers and house plants appropriate to the period, tools and artefacts demonstrating cultivation methods of the period are also exhibited, some on loan from The National Trust of Guernsey. During open days, interpretation boards depict the reinstatement of the garden and its buildings, the history of the de Saumarez family and the association with James de Saumarez and the history of the Park. Now that the garden and glass houses are established, we are focusing on plans to create “The Gatehouse” at the main garden entrance, to include an education centre for horticultural studies, a visitor centre and an administration area. The development of The Gatehouse is likely to cost in excess of £250,000 and is dependent upon fund-raising events and a dedicated fund-raising campaign. Your support is appreciated. The Victorian Walled Kitchen Garden at Saumarez Park has become a social centre for people seeking opportunities to work in a garden but without the responsibility of ownership. It is also a place of great interest for islanders and visitors, in association with our neighbours, the National Trust of Guernsey’s Folk & Costume Museum, Saumarez Park Tea Rooms, and St. John’s Residential Home. Without our volunteers, the garden would not and could not exist. We are always pleased to see additional volunteers to help with the gardening. Most volunteer gardeners attend on Saturday mornings and/or Wednesday afternoons. If you feel like becoming involved, your commitment can be as little or as great as you wish from half an hour’s occasional hoeing, to regular attendance. Please just turn up on the day, or contact Ivan Le Tissier by email, or give him a call on 07911 719115. We very much look forward to welcoming you and your gardening friends soon.